Like any Star Wars movie, Solo was filled to the brim with a number of Easter Eggs, references and cameos. Many of these Easter Eggs were quite obvious, with the regularly quoted "Kessel Run" being the midpoint of the movie, and Jabba the Hutt being mentioned quite a few times during the third act. While Solo was the first Star Wars movie to not feature R2-D2 or C-3P0, it still managed to include a number of other Easter Eggs that many Star Wars fans did not expect, including a number that were so brief or subtle that it was easy to overlook them. With that in mind, here are 6 Star Wars Easter Eggs and references you may have missed in Solo: A Star Wars Story. In Star Wars: Return of the Jedi, Lando Calrissian helped break Han out of Jabba's Palace by disguising himself as one of Jabba's guards. He did this by wearing a horned mask / helmet. While no one else in Jabba's Palace wore a mask like that, Lando still managed to pass as a guard, making it the perfect disguise. This mask made an appearance in Solo: A Star Wars Story about halfway through the movie. Beckett, played by Woody Harrelson, wore this mask during their infiltration of the mine on Kessel, which helped disguise the infamous criminal. It's likely that this mask remained on the Falcon after the events of Solo, leading to Lando deciding to wear it himself during the events of Return of the Jedi. Star Wars: The Empire Strikes Back introduced a number of the galaxy's most feared and distinguished bounty hunters. Among these bounty hunters was Bossk, a Trandoshan criminal, who looked like a humanoid reptile. Bossk became an instant fan favorite, and received a bit of development in the Extended Universe books and comics. He even appeared in a few episodes of the animated series Star Wars: The Clone Wars. 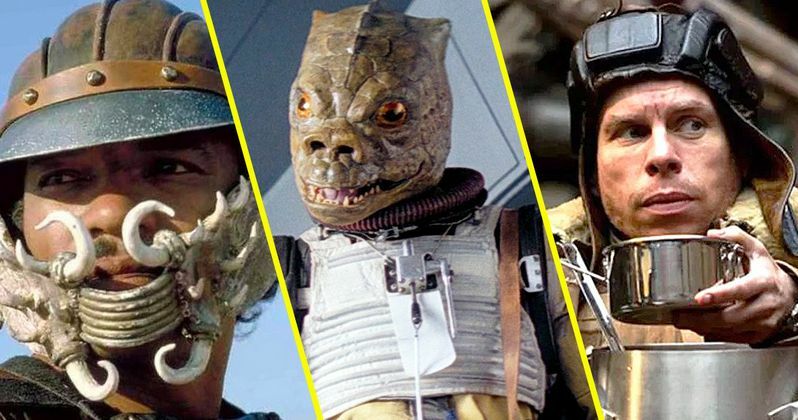 Bossk received a namedrop early on in Solo: A Star Wars Story, being revealed as one of the criminals that the Crimson Dawn had considered hiring rather than Beckett. This brief reference may end up becoming more than a reference, however. As the end of Solo revealed, the spin-offs are open to bringing back fan favorite characters who received little development in the primary Star Wars saga. Perhaps Bossk's affiliation with the Crimson Dawn will pay off down the road, with him possibly appearing in a sequel as a potential antagonist. 3 Lando's Pronunciaton Of "Han"
Star Wars: The Empire Strikes Back confused a number of fans about the pronunciation of Han's name. Despite his name always being pronounced similarly to "Hon" in the original Star Wars movie, Lando Calrissian pronounced it like "hand," but without the "d," in Empire. This was theorized to be an error by actor Billy Dee Williams, who may not have realized the actual pronunciation, but the reasoning was never actually explained..
Solo: A Star Wars Story gave an explanation to this plot hole by having Lando, this time played by Donald Glover, pronounce Han once again with a soft "a." This time, however, Han actually corrected the mispronunciation, but Lando refused to pronounce it any other way, becoming both a clever reference and a feasible explanation. The third act of Rogue One: A Star Wars Story took place on Scarif, the Empire-occupied planet in the Outer Rim. Scarif was revealed to have a number of technological advances made by the Empire that became an essential part in developing their weaponry, including the Death Star. This was also where a number of the weaponry plans and blueprints were located, in addition to a number of AT-AT prototypes. Scarif was mentioned towards the beginning of Solo: A Star Wars Story when Becket, Han, Qi'ra, and Dryden Vos were trying to decide upon a planet to take hyperfuel coaxium from. However, the idea of stealing from Scarif was almost immediately tossed aside due to its Imperial occupation. It was a very quick reference, but helped to tie Solo in with the rest of the Star Wars franchise. This was a little less subtle of a reference in Solo, but helped to tie the universe together a bit more. Han's chained dice first appeared in Star Wars: A New Hope, being briefly shown hanging in the cockpit of the Millenium Falcon. The dice later appeared in Star Wars: The Last Jedi when Luke found them aboard the Falcon, and went on to give them to Leia. Solo: A Star Wars Story showed the significance of the dice, with them being Han's good luck charm during his days on Corellia. However, upon leaving Corellia, the dice were left with Qi'ra. Qi'ra later gave the dice back to Han when he was being held as prisoner on Kessel, giving the "luck" back to him. The dice became more than just a symbol of luck for Han, developing into a symbol of his love for Qi'ra. It is likely that the dice will become more prominent in future Han Solo movies. Willow, Leprechaun, and Harry Potter actor Warwick Davis made his debut to the Star Wars franchise in Star Wars: Return of the Jedi when he played Wicket the Ewok. Since then, Davis has appeared in five other Star Wars movies, playing a different character each time. While none of his appearances were ever as notable as his role in Return of the Jedi, the cameos have become a regular part of the franchise. While most of the earlier appearances by Davis featured him in an alien costume, or as a CGI character, Solo: A Star Wars Story became the second movie to feature Warwick Davis actually showing his face. Davis unmasked himself during the third act of Solo, playing a member of Enfys Nest's team of Cloud Riders. It was a brief, yet admirable, cameo by the legendary Star Wars actor that was certainly appreciated by some of the more devoted fans of the saga. These were certainly not all of the references and Easter Eggs in Solo: A Star Wars Story, but they were quite easy to miss. What Easter Eggs, references or cameos did you spot in the latest of Lucasfilm's Star Wars spin-off? Let us know in the comments!